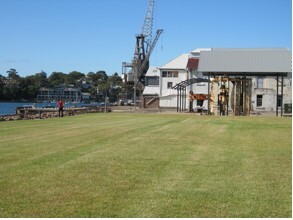 Cockatoo Island has been a prison and a shipyard since European colonisation – and now it’s an urban park, with campsite. I’ve been to Cockatoo Island three times since 2008 and each time has been extraordinary: first for the Sydney Biennale, then for Nick Cave’s 2009 music extravaganza ‘All Tomorrow’s Parties’ and again last week. As I walked around the island last Thursday, through its ruined warehouses and abandoned dockyards, past rusted machinery and sandstone cliffs overlooking the harbour, I thought: some government has got it right. As it turns out, it was the federal government of 2001, which put the island in the care of the Sydney Harbour Federation Trust. It got it right because it left the island alone, pretty much, and gave it to the people. Despite its convict past and dereliction Cockatoo Island feels alive, haunted perhaps but not devastated. 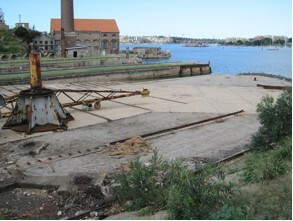 In 2008 for the first time Cockatoo Island was used as a venue for the Sydney Biennale. The standout works for me were installations by Mike Parr, Shaun Gladwell and William Kentridge. Their work gathered force, danger, poignancy among the ruins of Cockatoo Island in a way I could not imagine being possible in the safe spaces of the Museum of Contemporary Art, the Art Gallery of New South Wales or Artspace in Woolloomooloo. Performance artist Mike Parr’s retrospective ‘MIRROR/ARSE: Revolutions – Forms that turn’, films of seventeen of his most intense explorations of pain and the limits of the human body, was installed in a derelict naval building. The building felt as unsafe as Parr’s art – doors opened to the sky, uneven floors were pooled with water, ceilings sank, paint peeled, it stank. Negotiating my way along dim corridors to take in Parr’s performances of trauma itself verged on traumatic. Video artist Shaun Gladwell’s multimedia work ‘Street Haunting/Ghost Riding/Organ’ was installed in a cavernous brick building. I stood mesmerized first by the space and then by his video of a riderless bicycle careening through deserted city streets. The work of South African artist William Kentridge was displayed in two areas. In one, up a rickety wooden staircase under the eaves, his anamorphic film ‘What Will Come (Has Already Come)’ screened animated drawings of horses, reeling bodies, bombers spinning on a cylindrical mirror on a table. It was about the 1930s Italian bombing of Ethiopia with mustard gas. In the other, ‘I am not me, the horse is not mine (2008)’, his film projections for the Shostakovich opera The Nose (based on the Gogol story) were screened on the bare brick of an old warehouse. Six months later under a beating January sun and into the night Cockatoo Island hosted Nick Cave’s ‘All Tomorrow’s Parties’, a multi-venue music festival starring the reunited Saints. It included one of Mick Harvey’s last performances with the Bad Seeds and Dave Mason and the Reels washed up from the 1980s, as well as newer bands like Spiritualized and the unleashed guitar and percussion of Afrirampo; Nick Cave himself was in particularly louche form. The main stage of ‘All Tomorrow’s Parties’ was at the far end of this stretch of grass. Last week it was deserted, a harbourside haven open to anyone with a ferry fare. 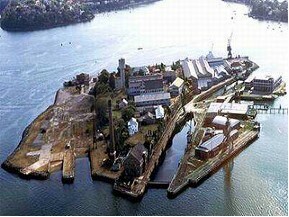 Cockatoo Island is historically significant as both a prison and an industrial powerhouse; it offers a variety and vastness of space, which is a fantastic challenge and privilege for artists. It is one of the unique environments of Sydney and we will be filling it with art. If you haven’t been there already, check it out. 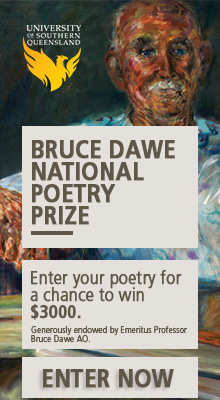 you’ve inspired to me come check it out next time I’m in Sydney. Thanks for this. I loved the Sydney Biennale. Cockatoo Island was somehow very ordinary and at the same time astonishing. I couldn’t image those art works anywhere else. Yes, perhaps that’s it Sharon – there was something so ordinary and yet astonishing about the Cockatoo Island part of the biennale. I possibly wouldn’t have been so gripped by the Gladwell piece if it hadn’t been in such a haunted, disintegrating, lofty space and seemed incidental. CI is interesting in light of your piece on the development of Darwin Rohan – there are miraculously some spaces in Sydney that are being left alone architecturally and used ‘creatively’, mostly around the harbour so I guess tourism is one big incentive behind the phenomenon, including Jones Bay Wharf and nearby park in Ultimo and the wharves west of the Harbour Bridge (although they’re flanked by high end luxury apts). Actually meant Pyrmont, not Ultimo. Thanks for the link jenjen, what an amazing thing for your friend to have done. Didn’t know there were residencies on Cockatoo Island. Gets better and better. And you’re right – it is a ‘good’ island. I walked around alone in the dark after midnight and it just felt good. Which didn’t seem to fit with its convict past. Weird huh.